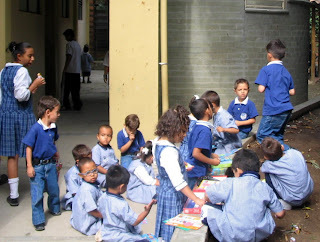 The school in Colombia has sent a thank-you letter to the ACCESS Charity for the funds sent in April. Principal of the school, Miriam Rocio, explained that they are very glad that they will be able to start construction of the recreational patio for kindergarten students, thanks to the money that ACCESS has sent. The school has offered to send us pictures periodically of the development of the project. Here is an image of the existing school in Itagui, Colombia. Currently, this is the only area in which the kindergarten children have to play.